To get to the beach at Es Canutells you have to negotiate some steep stone steps but the soft, pristine, golden sand shelving gently into the clean, bright crystal clear sea more than justifies the effort. The sea shore is a great place for children to paddle and play and will keep them absorbed for hours. This is not a commercialised place - no sunloungers or parasols are available but there is a beach bar to keep you topped up with beer and ice cream. Or you can enjoy a decent lunch whilst gazing out to sea. If you fancy a night out, take a taxi from your villa to the neighbouring resort of Calan Porter for a greater choice of bars and restaurants.To get to the beach at Es Canutells you have to negotiate some steep stone steps but the soft, pristine, golden sand shelving gently into the clean, bright crystal clear sea more than justifies the effort. The sea shore is a great place for children to paddle and play and will keep them absorbed for hours. This is not a commercialised place - no sunloungers or parasols are available but there is a beach bar to keep you topped up with beer and ice cream. Or you can enjoy a decent lunch whilst gazing out to sea. If you fancy a night out, take a taxi from your villa to the neighbouring resort of Calan Porter for a greater choice of bars and restaurants. 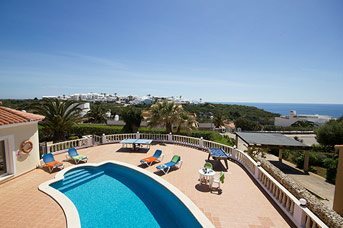 Es Canutells is a mixture of private homes, holiday villas like yours and the Aparthotel Mar de Menorca complex. There are two restaurants with bars, a supermarket and a gift shop. For more sophisticated shopping head for Mahon – don’t miss the small, interesting independent shops of the historic old quarter. In nearby Calen Porter, shops and supermarkets are clustered together in the town centre, and as the holiday resort is particularly well loved by British visitors, you will be able to find a lot of familiar products – possibly even Marmite! At around seven in the evening on Mondays and Thursdays a great little pop-up market pops up in the town centre, selling all sorts of useful things such as leather goods, jewellery, clothes and souvenirs, so grab yourself a bargain. 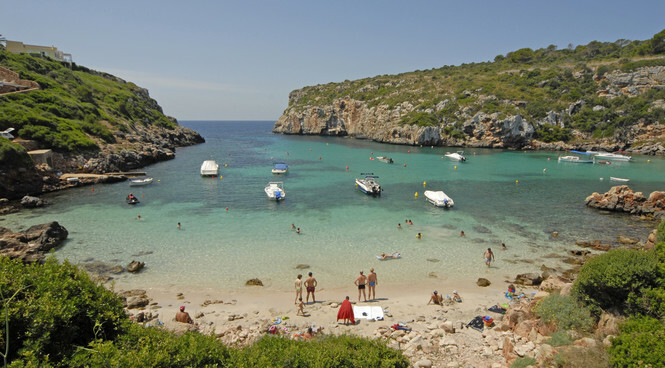 The dramatic rocky coastline with its caves, coves and inlets are ideal for snorkelling, and the cliffs surrounding the cove at Es Canutells mean that the beach is sheltered and there is excellent visibility underwater. The rocks around the headland are a good place to look for starfish and purple urchins, exotic polka dot cardinal fish and neon damselfish. In the deeper water you might spot octopus or sea bass. You can find a strange and magical place near Es Canutells, where Necropolis burial caves have been cut into the soft limestone cliffs. Almost a hundred man-made Bronze-age caves look out onto a sheltered bay. You reach it down a bumpy, unmade road about 1.5 km long, cut into the steep sided limestone gorge. Some of the caves can be reached via a footpath over the cliffs. These caves have been inhabited at various times since 9 B.C. and have also been used as burial grounds, with wall paintings and carvings. There are no facilities at all here, so make sure you bring plenty of water with you.